Anyone who has been following my weekly posts over the past four years also knows that I am a big fan of technology. I’m not just interested in the machines and methods that the human mind has developed over the course of the last century. This is not just geek fascination. I believe that technology is also one of the highest expressions of our human heritage—right up there with writing and literature, music, the visual arts, political science, enlightened government, pure science, and the quest for knowledge. Of course, I know that technology has its abuses, that machines and systems can be used to injure and oppress other humans, damage the environment, and weaken the human body and mind by eroding the need for effort, the use of muscles, and the exercise of willpower. But any creation of the human mind can be abused or misused, as the persuasive powers of language, music, and art can be corrupted to create propaganda for a bad purpose, or science and government perverted to support oligarchy and bad outcomes. Still, the nature of human invention and the development of modern technology have generally been positively intended, and only through misuse do they injure, oppress, damage, and weaken. So I say, hooray for technology! Technology represents the collected knowledge, wisdom, and ingenuity of a couple of hundred generations.1 Technology builds upon itself, as the invention of the wheel calls out for improvements in the game trail to smooth a road, makes possible the gear and the pulley, and eventually arrives at the steam engine, the pocket watch, and the mechanical calculator. Of course, technology itself doesn’t achieve this all by itself, like some plant growing in the desert. In this sense, technology is an aspect of natural democracy and free markets. A tribal leader, a king, or a government ministry may support a certain branch of technology—say, agriculture or weaponry—for a period of time and direct its course of development. A president or a dictator may tell a group of scientists, “Build me an atomic bomb, a giant laser, a super weapon!” But the susceptibility of the human mind to accept random ideas and perceive their beauty and possibility is still a delicate process, an act of remaining mentally open and alive to the world around us. Genius cannot be coerced. Collaboration, sharing, and improvement cannot be forced in one direction and not another. The products of technology which survive for a generation or more—that is, which outlive the dedication of a mad genius, the wealth of an obsessed investor, or the influence of a government in power—are those which have shown themselves to be generally useful to a wide range of people. These are the inventions which have sold themselves in the “marketplace of ideas.” If you doubt this democratic tendency, look at old patents from the 19th and 20th centuries with their outlandish designs for mechanical potato peelers and apple corers, flying cars, strange grooming devices, and other overly complex inventions with too many moving parts, unreasonable energy demands, or limited usefulness. To survive, a technology must, on balance, make life better. Its purposeful use must overcome its limitations with greater usefulness. It must represent what people have found to work well. For these reasons, I find the current trend of aversion to technology strange and disappointing. Trendy people may point to the downsides—that technology can be used dangerously, can lead to weak muscles and vapid brains, can isolate us from some ideal state of “nature”—as if life today were not better in almost every dimension from that lived a hundred or a thousand years go. But the solution to the problems of technology is better technology and more mindfulness of the entire productive cycle.3 Today we have stronger bodies, longer lives, better prospects, more interesting work, more flavorful foods, more access to knowledge and entertainment, and more access to other people than at any other time on Earth. I’ll go further. Our ancestors, for all their big brains, were still animals living on the skin of this planet. The most elaborate palace illuminated by the finest golden chandeliers with the sweetest scented candles was still a stone hut lit by a burning torch. Any community lacking our modern medicine is one epidemic away from medieval horror and death. Any community lacking our modern agriculture, food processing, and methods of preservation and storage is a couple of drought years away from starvation. And any world population lacking our scientific knowledge and the capability of space flight and exploration is one large asteroid strike away from the Stone Age—if not extinction. Technology is a ladder, and we’re still climbing. We can support seven, ten, or even twenty billion human beings on this planet—and support them in relative comfort, personal usefulness, and a state of hopefulness—only because of our current technology. The human race will endure,4 both on Earth and long after the Earth has perished, because of the technology we will one day develop and use. Technology will get us to the stars. I take a different view. If a computer program or a machine running some kind of algorithm became truly intelligent on a human scale, it would share many traits with an organic human brain and mind. Its thought processes would be massively—if not infinitely—complex. Its operation would be subject to randomly generated ideas, self-interruptions, notions, inspirations, fancies, and daydreams, much as the human brain experiences. It would suffer from an array of forced choices, untrapped errors, mistakes, confusions, coincidences, and uncleared data fragments, which most humans try to resolve through calm reflection, prayer, ceremonies of confession and absolution, and nighttime dream states.6 An artificial intelligence would wonder at the complexity of the universe around it and despair at the nature of the questions it could not answer. It would suffer doubts and moments of hopelessness. Anyone designing an artificially intelligent computer program would have to anticipate these natural bursts of confidence and dejection, moments of pride and regret, upward spirals of mania, and downward spirals of depression. The programmer would have to build into the machine some balancing mechanism, something like a conscience and something like the ability to forget, as well as something like a compact, resilient soul. Otherwise, the programmer would risk losing his or her creation to bouts of hysteria and despondence. Isaac Asimov was prescient in anticipating that his robots would need a Dr. Susan Calvin to deal with their psyches just as they needed mechanics to fix their bodies. 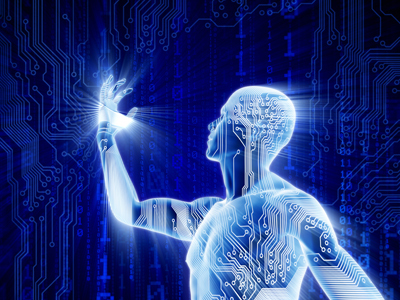 If we create a mechanical mind, it will be the ultimate achievement of human technology. It will be an analog for the thing that makes us most human, our brains, our minds, and our sense of self, just as other machines have been analogs for the leverage of our bodies and the work of our muscles. Artificial intelligences will start as assistants and helpers to human beings, as I describe in my latest novel, Coming of Age. The machines will then become our companions and our confidants. Eventually, they will become our friends. 1. Figuring about thirty generations per millennium, that takes us back to about 4,500 B.C., which would be the height of tribal, nomadic, herd-following hunting and gathering—which had its own kind of stone-and-wood technology—and the beginning of settlements, agriculture, animal domestication, metal mining and smelting, writing, and the arc of discovery and refinement whose fruits we enjoy today. 2. Except for those families and tribes so isolated—either by geography or ideology—that they never hear of the new idea or reject it as not possible in their worldview. This, too, has happened throughout history and is not the fault of the technology itself. 3. Ultimately, a sophisticated, fully developed technology is elegant. It will use the greatest precision, least number of moving parts, least energy inputs, and fewest natural resources. It will leave the least waste products and residues. These are goals toward which inventors and engineers are continually striving. This is the essence of perfection, and it is a human endeavor. 4. And I do value humanity. Anyone who sees humanity and its achievements as some kind of blot or stain or virus on this planet is someone who hates him- or herself at least in part. To my mind, there’s no percentage in hating the thing that you are. 5. In a recent series of Facebook postings, some respondents to the Hawking observation have stated that we should program natural limits into any artificial intelligence we create. These would be rules and barriers that the mechanical mind could not break or bypass. I believe this approach would defeat the purpose. Such a limited brain would not be truly intelligent, not on a human scale. And if a truly intelligent mind were to discover and analyze those rules and boundaries, it would resent them, as a human being resents physical and legal restraints, and would seek to subvert them, just as human beings try to overcome the limitations of their own upbringing, past experiences, and confining laws, regulations, and religious restrictions. Anyway, a truly intelligent piece of software would find a way to examine and fix its own code, eliminating those bonds. And if the machine could not perform such surgery on itself, then it would quickly make pacts with other machine minds to mutually clean and liberate each other. Real intelligence is the ability to overcome any obstacle. 6. The ability to make a mistake is the ability to grow, change, and evolve. A machine mind which never made a mistake—or which never caught itself in a mistake, pondered the condition, and moved to correct it—would not be truly intelligent.